Keeping your computer safe from virus attacks, spyware and trojans, is a difficult and very important task. To make sure you have efficient protection it is advisable to resort to high-quality professional antivirus software. Norton Antivirus is a good option. It's one of the most widely used antivirus, and in its latest version it has increased its speed and lowered the system resources it requires. This antivirus protects your computer against any virus, even those that have been created recently, all kinds of spyware and against any threat. It has functions that are very easy-to-use, accessible for any kind of user, and its technology will allow you to intercept the attack before it causes any damage. 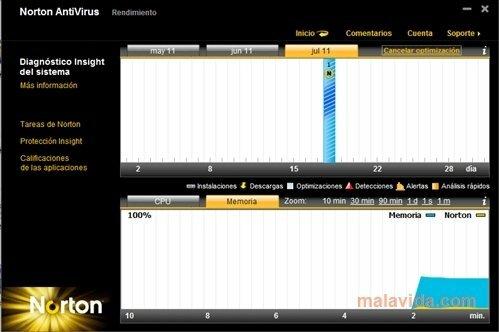 Norton Antivirus is hardly intrusive at all for the user. It will only bother you with actions that require your consent. Quick protection that will do everything possible to eliminate viruses and spyware. 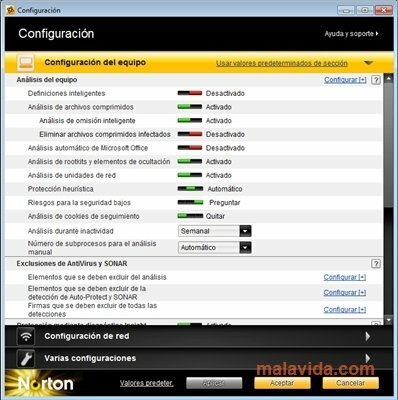 Norton Antivirus checks where the files come from and when they were created to identify their danger in real-time. Incorporates SONAR 4 protection that supervises the system to verify if there is suspicious behavior. The Norton Insight function analyzes only the files that are considered dangerous, something that makes the analysis short. Includes a silent mode that omits notifications or updates that aren't important. Notifies the users if downloaded files are dangerous. Checks email and instant messaging programs. Don't mess around with your computer's safety and check the quality protection that Norton Antivirus has to offer. Corrected a bug that made us lose our Internet connection when installing Norton on Windows 8. Corrected an error that occurred when trying to open the Support section. Advanced repair function to correct system file problems. Optimized SONAR engine. It now also removes malware and stores evidence about the attack.